I hope everyone has had a productive start to the semester. My internship is with the Center for Digital Humanities and Research, where I will be working on two different projects. The first project is a redesign of the Florida Digital Humanities website. I hope to update the website so that it becomes a location for Florida DH professionals to engage with each other and to share best practices. So far, I have discussed possible directions for the website with Dr. French, my internship mentor, and have received survey results from FLDH members from the previous intern, Bob Clarke. This week, I hope to review these results and begin my work plan for the remainder of the semester and to set priorities based on the wants, needs, and desires of members. On August 31st, I met with the members of the visualization team to discuss our work plan for the semester. In addition to the Sprague data, the team is also compiling other data sources, including enlistment records from the U.S. Army and tables from other historical publications. 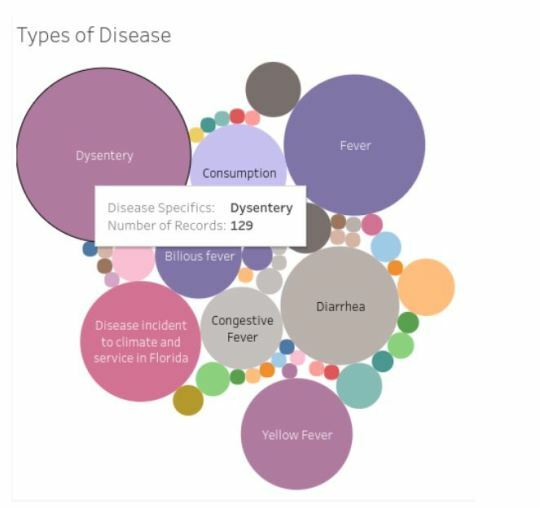 It is our hope that this data will help us create a more nuanced data visualization of the Seminole War that will combine casualty data with enlistment data, occupation, and place of birth for soldiers that will help create a historical narrative. We also hope to document our data standardization strategies and workflow so that they can serve as a best practice for future scholarly projects in the digital humanities. This week, the team is researching different data sources (Including Ancestry.com) and having discussions about how to standardize data fields and clean up existing data. My next steps are to review my visualization from last semester and document how I standardized my own data, and to refamiliarize myself with Tableau Public.